So, I had a baby girl almost 7 months ago and the poor blog has gone by the waste side, again. However, I have not stopped cooking, crafting and decorating and now I’ve even acquired some new skills such as baby food-making! More to come on recipes for baby food. Back in the spring, our good friends Ryan and Jessica Legaux came to visit and spoiled us with their amazing cooking. They have owned and operated the Creole restaurant, Harold and Belle’s, in Los Angeles. For 3 generations and over 47 years Harold and Belle’s has become a fixture in the Jefferson Park community. They recently did a remodel of the restaurant and it looks better than ever, so if you are ever in the L.A. area and looking for something unique or simply craving true New Orleans-style food, I highly recommend it. Ryan is such a great cook and can truly whip anything up out of anything. Remember the Crab Stuffed Mirlitons I posted years ago? Those were his! 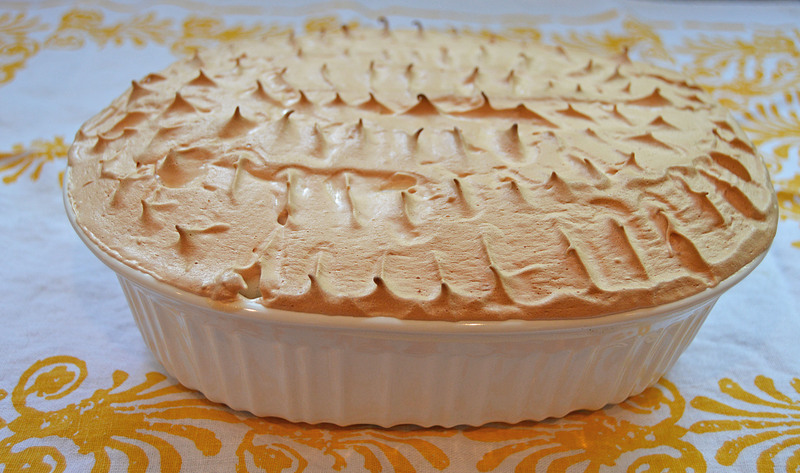 And he’s back as my guest cook with this decadent Lemon Ice Box Pie. 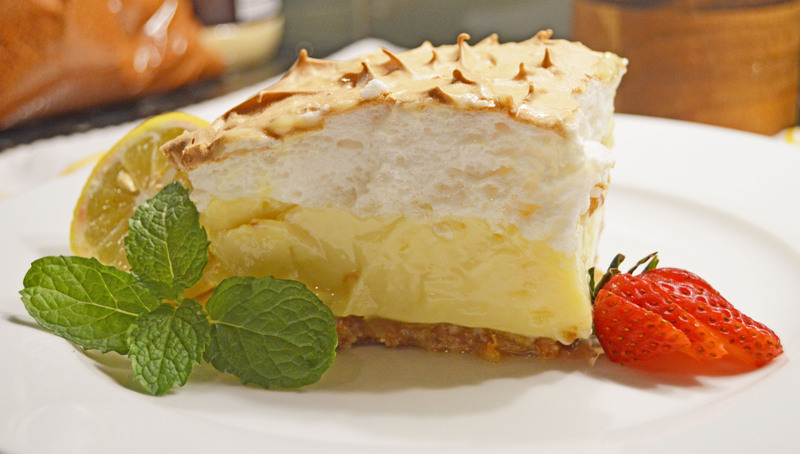 Lemon Ice Box pie is a simple pie recipe that earns it’s name because it requires refrigeration to set and Ryan kicks his up with a Nilla Wafer crust and a meringue topping that he peaks and then bakes in the oven to create a light and almost crispy texture on top of the pie. The layers of airy meringue, the tart lemon custard filling and a butter cookie crust make for a divine summer or spring dessert! Cook time – 20 min. Pulse vanilla wafers in a food processor or crush by hand until they are the consistency of course sand. Some large chunks are ok. Mix the melted butter with the crushed wafters until blended. Press into the bottom of a greased pie pan or 6X8 serving dish. Separate the egg yolks in a large mixing bowl and save the egg whites in a separate mixing bowl for the meringue. Add the sweetened condensed milk, lemon juice and lemon zest to the egg yolks and mix with a fork or whisk. Pour mixture over the pie crust. With a hand or stand mixer, whisk the egg whites, cream a tartar, vanilla and 2-3 tablespoons of sugar to taste. You can add more or less sugar to your liking. Beat until it’s fluffy and forms peaks on the mixer attachments. Layer the meringue on top of the custard mixture . Smooth out with a spatula and then form peaks by taking a regular teaspoon and placing it on the topping and pulling it straight up. See the photo above for guidance. Bake the pie for 20 min at 350 degrees until the meringue is golden brown. Let sit in the refrigerator for at least 6 hours.